PRO #1 precision duty knife with non-roll handle and clear plastic safety cap. For precision cutting. PRO #2 medium duty knife with non-roll handle and clear plastic safety cap. For use in cutting medium and heavyweight materials. Molded plastic handle with built-in pocket clip. Holds a retractable, replaceable and reversible PRO #8 blade. Light weight plastic utility knife with a pocket clip. Features a retractable, replaceable, breakaway blade with 13 points. All steel construction eqipped with reversible, retractable, replaceable PRO #92 blade. For industrial mechanical, electronic, carpentry and all household uses. 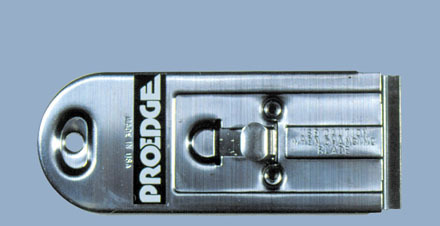 All steel construction holds PRO #9 single edge razor blade. Blade is retractable, replaceable and reversible. For all purposes at home, work or in the car. All steel construction equipped with retractable, replaceable PRO #9 single edge razor blade. For household and industrial use.